Once the United States entered the war, many female reporters wanted a war reporting assignment. Initially, the U.S. military refused to accredit women (See Scholar Michael Sweeney’s essay on accreditation.) because all reporters are a burden on the military — they have to be fed, clothed, housed, and protected. But accrediting women would require an additional burden: special facilities (toilets and housing) would have to be created for them. As the war progressed, more and more men were needed to fight. The Women’s Auxiliary Corps (WACs) became the solution to freeing up men who held administrative jobs within the military. But sending women into a military zone, even into the rear areas to perform administrative work, was enormously controversial. 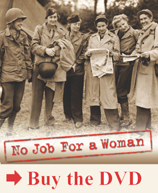 Women reporters were assigned the task of reporting on the activities of female military personnel so that Americans would see that they were safe and leading normal lives. Over the course of the war nearly 140 female reporters were accredited.